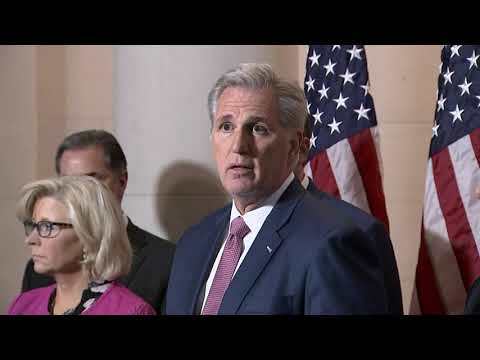 WASHINGTON (AP) — Republican Rep. Kevin McCarthy easily won an internal party election Wednesday to take over the shrunken House GOP caucus, handing the seven-term Californian a familiar role of building the party back to a majority as well as protecting President Donald Trump’s agenda. With current speaker Paul Ryan retiring and the House majority gone, the race for minority leader was McCarthy’s to lose. But rarely has a leader of a party that suffered a major defeat — Democrats wiped out Republicans in GOP-held suburban districts from New York to McCarthy’s own backyard — been so handily rewarded. “We’ll be back,” McCarthy promised, claiming a unified front for the Republican leadership team. He won by 159-43 among House Republicans. McCarthy, who has been majority leader under Ryan, acknowledged Republicans “took a beating” in the suburbs in last week’s national elections, especially as the ranks of GOP female lawmakers plummeted from 23 to 13. The GOP side of the aisle will be made up of 90 percent white men in the new Congress — an imbalance he blamed on billionaire former New York Mayor Michael Bloomberg’s election spending to help Democrats. McCarthy made that argument, too, lawmakers said, suggesting that those who lost their races — or came close to losing — didn’t work hard enough to sell the GOP’s message. At one point, ads featuring McCarthy were running promoting Trump’s border wall. But after eight years of GOP control, the tea party class of 2010 is long gone. So too are the “Young Guns” — former leader Eric Cantor and outgoing Speaker Ryan — who penned that strategy. Voters largely panned the party’s latest signature accomplishment, Trump’s tax cuts, and Republicans have all but abandoned the tea party promises to cut the deficit and repeal and replace former President Barack Obama’s health care law.